Kiwi rally driver, Michael Young, has taken out the Asia Pacific Rally Championship (APRC) Junior Cup title two rounds early in his Cusco Racing Proton Satria Neo in Malaysia over the weekend, along with extending his lead in the two-wheel-drive cup. Young, originally from Opotiki in Bay of Plenty, finished the rally in eighth place securing the Junior Cup title and putting him fourth in the overall APRC drivers’ championship, along with extending his lead in the two-wheel-drive cup by over 50 points and moving to within two points of the production cup lead. 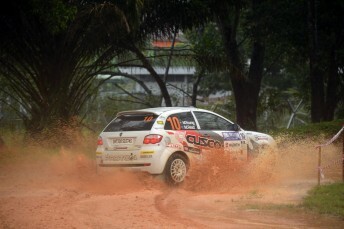 “I’m very happy to win the APRC two-wheel-drive and Junior Cup classes at the latest Malaysian Rally. It was enough to secure the Junior Championship for 2014 and extend our lead in two-wheel-drive,” said Young. Despite losing four minutes on day one, Young and Kiwi co-driver Malcolm Read who is again observing a World Rally Championship event alongside New Zealand WRC driver Hayden Paddon, remained competitive and said their approach was to keep their championship chances on track. Young said: “I drove with a clean mind all weekend and pushed on to keep my concentrations levels up. It helped to stay alert in the muddy sections that caught a lot of people out. Young and Read now look towards their next rally; Rally Hokkaido in Japan, but not before stopping at the WRC event in Germany which Young says is highly beneficial to his APRC career. “I am now in Germany for the latest round of the WRC which is on tarmac. I’m just soaking up as much [information] as I can. We are here to experience the scene in Europe and look for opportunities for 2015. But I’m still focused on our next rally in Japan. Rally Hokkaido is a favourite of mine; it’s a very quick rally on soft flat out forest roads,” said Young.